Large fuchsia blooms are sure to brighten the winter up. Big, hot pink petals are impossible to miss. Blooms are plentiful on strong stems. Holland's finest strain produces more huge flowers per bulb than any other strain. The spectacular breathtaking beauty of the brilliant colors must be seen to be believed. Blooms reach over 8 inches across. Large size bulbs produce two huge stems each with 4-5 giant flowers per stem. Bulb size: 34/36 cm. In frost free sections of the country amaryllis may be grown outside in the garden. In all areas of the country they are raised for their spectacular blooms indoors in the depths of winter. Their huge, trumpet-shaped flowers provide a bold splash of color, brightening even the saddest winter day. Our bulbs are jumbo in size, strong performers, producing at least two stems per bulb, with each stem bearing 4 to 5 flowers. Amaryllis requires a porous, nutritious planting medium. Many are available with a pre-mixed medium. Add about one teaspoon of bone meal per 5-6 inch pot. For each amaryllis, use a pot one inch wider than the diameter of the bulb. If your pot does not have a drainage hole, put pebbles, or other coarse material, in the bottom of the pot for drainage. For indoor planting we recommend using a cachepot without drainage holes on the bottom. If your pot does have drainage holes, be sure to place it on a plate to catch excess water. Fill the pot to within one half inch of the rim, to leave room for watering. Situate the bulb so that the soil line is around the widest part of the bulb, with one-half of the bulb below the soil and one-half of the bulb above. Once the bulb is potted, water until the planting medium is just damp and place in a warm location with direct light. Heat is necessary for the development of the stems, and the plants prefer plenty of sunlight, although protection from the afternoon sun will extend the bloom season. The ideal temperature is 68 to 70 degrees F. Water sparingly until the flower stalks appear as too much water at this time will cause leaf development at the expense of flower development. As the flower bud develops, water more thoroughly and frequently. An occasional feeding with a balanced houseplant fertilizer will increase the size and beauty of the flowers. Bulbs will flower in 7-10 weeks as a general rule. In winter the time to bloom will be longer than in spring, so consider this when you plant your bulbs. 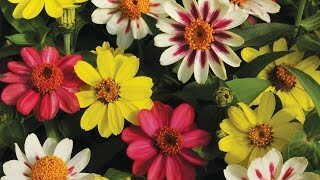 For the most continuous bloom, plant at intervals of 2 weeks for stunning color in your home or garden. After amaryllis has stopped flowering, it can be made to flower again. When the flowers fade, cut the old flower stems to one inch from the bulb and allow the foliage to develop. Continue to keep well watered and fertilized. When all danger of frost is past and the weather is consistently warm, sink the pots up to their rims in the garden outdoors. Choose a semi-shady, sheltered location. Keep well watered, taking care that the water drains well between waterings, for at least 5-6 months, allowing the leaves to fully develop. When the leaves begin to turn yellow, which normally occurs in early fall, cut them back to about 2 inches from the top of the bulb and remove the bulb from the soil. Clean the bulb and place it in a cool (40-50 degree F), dark location, such as the crisper of your refrigerator, for a minimum of 6 weeks. Caution: Do not store amaryllis bulbs in a refrigerator that contains apples as this will sterilize the bulbs. Store the bulbs for a minimum of 6 weeks. After 6 weeks you may remove bulbs whenever you would like to plant them. Plant bulbs 8 weeks before you would like them to bloom.